It is considered by many to be somewhat pretentious to call oneself a writer, and perhaps even more so to promote oneself as a writing mentor and editor. Maybe this is why the value of an editor is so decidedly under-valued, proof being the invisibility of an editor’s work in the writer’s final, polished writing. 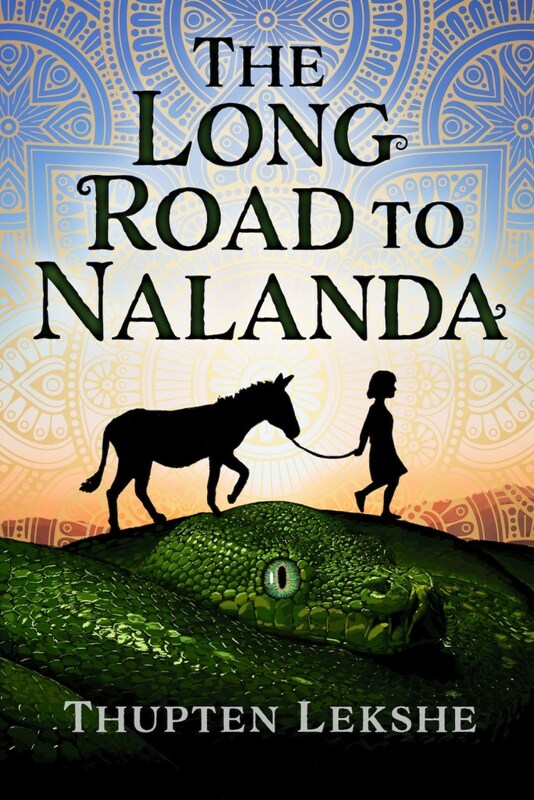 The most compelling and authentic written work is not a means to an end, but a journey to discover and unravel the “thousands of thoughts lying within a man [or woman] that he [or she] does not know until he [or she] takes up the pen and writes”; so observes nineteenth-century British novelist William Thackeray. I admire the ability of writers to write organically and I encourage the practice as a writing mentor. In my own writing, the unforeseen discoveries become my most inspired work, and hopefully make for the most riveting reading. The text and the author should be in a constant process of negotiation. A writing mentor acts as adviser in the text-author-mentor triangle, providing guidance and digging to discover what the author is trying to accomplish. Conceit in a dogmatic writer is unpalatable, and can destroy the text. These are the writers who usually seek opinion from family and friends. Yesterday I finished the first part of To the Lighthouse, and today began the second . . . well, I rush at it, and at once scatter out two pages. Is it nonsense, is it brilliance? Why am I so flown with words and apparently free to do exactly what I like? When I read a bit it seems spirited too; needs compressing, but not much else. Worthy writers know that the writing process can be painful because it involves drafting and redrafting, and a proofreading run-through before they engage an editor. Editors are the first ‘real’ readers before the work is published, and they are often accused of wielding a sword or axe to a labour of love. Tiptoeing around obvious blunders is not recommended, but the application of an elegant pair of scissors will attempt to solve problems that are detected in the writing, with a needle and thread at the ready to mend and restore. 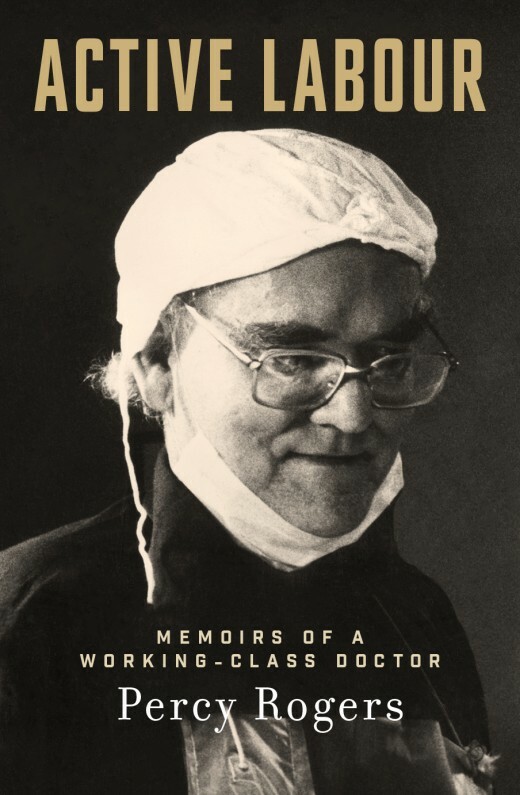 When I’m asked to edit, I remove my jaunty mentoring hat and don my broad-brimmed editing hat; the scissors, needle and thread come out of my box of tricks, and I begin. I’m on the lookout for many things, the main one being seamless, coherent writing: a series of clear sentences that relate closely with the context and point of view, and that are contained within paragraphs that get to the nitty-gritty of one idea/subject/theme. I look for connections between paragraphs and make sure connections are not broken. Misuse of grammar, excess flab, badly managed dialogue, inconsistent voice/tone, overuse of particular words and an incoherent structure are common culprits. What I’m not going to do is rewrite content; however, a good mentor and editor will always make suggestions as to how additional material or clarification of a subject may enhance the writing and help the reader understand (particularly when the writing is technical and non-fiction). Having witnessed a multitude of writing styles throughout my working career, I am now enjoying my role as a mentor, manuscript assessor and editor to writers, not only encouraging that uncontrollable urge to write, but to assist, humbly, with the honing of their craft. I’m happy working away, usually in the stillness of the night (when all through the house/Not a creature was stirring, not even a mouse), as the invisible mender. 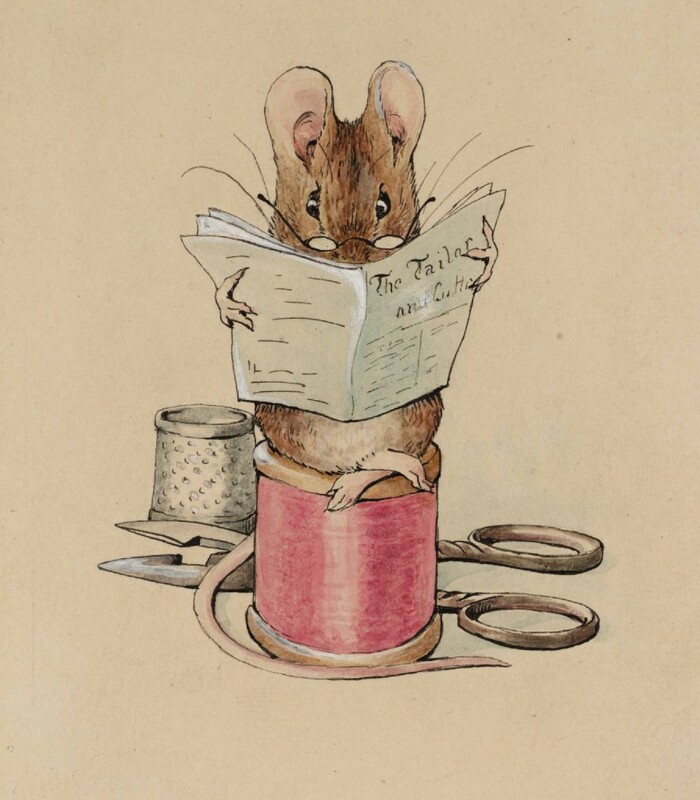 Helen Beatrix Potter, ‘Frontispiece: The Tailor Mouse’, From Illustrations for ‘The Tailor of Gloucester’, c.1902, ink, watercolour and gouache on paper, 111 x 92 mm, Tate, London. The illustrations for The Tailor of Gloucester, Beatrix Potter’s second and favourite book, were drawn in Gloucester and the country round about, the story being based on an actual Gloucestershire story that she heard while staying with a cousin near Stroud. The fabrics in the watercolours are said to have been taken from fabrics in the V. & A. 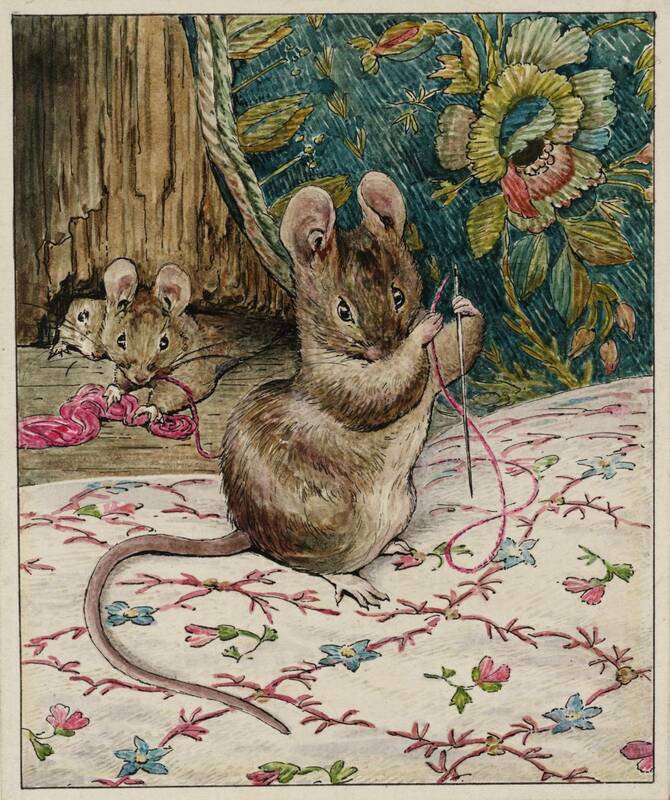 Featured image: Beatrix Potter, ‘The Mice at Work: Threading the Needle’, From Illustrations for ‘The Tailor of Gloucester’, c.1902, ink, watercolour and gouache on paper, 111 x 92 mm, Tate, London. If you have written a manuscript (finished or unfinished) that you think needs editing or a professional assessment, then please contact me with an overview of your writing project. I love the Potter images. And your analogy between the editor and the invisible mender is warm, humorous and apt. thank you Nita. Beatrix Potter gives those clever mice such intelligent eyes!